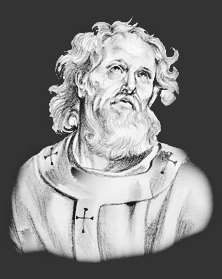 The story and history of Saint Augustine of Hippo. Saint Augustine was born in 354, at Tagaste in Africa. He was brought up in the Christian faith, but without receiving baptism. An ambitious school-boy of brilliant talents and violent passions, he early lost both his faith and his innocence. He persisted in his irregular life until he was thirty-two. Being then at Milan professing rhetoric, he tells us that the faith of his childhood had regained possession of his intellect, but that he could not as yet resolve to break the chains of evil habit. One day, a however, stung to the heart by the account of some sudden conversions, be cried out, "The unlearned rise and storm heaven, and we, with all our learning, for lack of heart lie wallowing here." He then withdrew into a garden, when a long and terrible conflict ensued. Suddenly a young fresh voice (he knows not whose) breaks in upon his strife with the words, "Take and read;" and he lights upon the passage beginning, "Walk honestly as in the day." The battle was won. He received baptism, returned home, and gave all to the poor. At Hippo, where he settled, he was consecrated bishop in 395. For thirty-five years he was the centre of ecclesiastical life in Africa, and the Church's mightiest champion against heresy; whilst his writings have been everywhere accepted as one of the principal sources of devotional thought and theological speculation. He died in 430. The Feast Day of Saint Augustine of Hippo is August 28. The origin of Feast Days: most saints have specially designated feast days and are associated with a specific day of the year and these are referred to as the saint's feast day. The feast days first arose from the very early Christian custom of the annual commemoration of martyrs on the dates of their deaths at the same time celebrating their birth into heaven.